1010 Techwood Dr NW (10th St NW) Atlanta,GA. Please join us on Friday, April 26th for a tour of the Turner ReImagined Techwood Campus in Midtown. Ted Turner founded Turner Broadcasting system in 1965. In 1979, Ted purchased acres of land north of Georgia Tech for the current Atlanta campus. Transitioning from a corporate campus of cubes and corridors, Turner engaged a team of design partners (Rapt Studio, HLGstudio and IdeaSpan) to reimagine the Techwood campus. The goal was to design an ecosystem of spaces that fostered a culture of innovation, creativity and excellence. 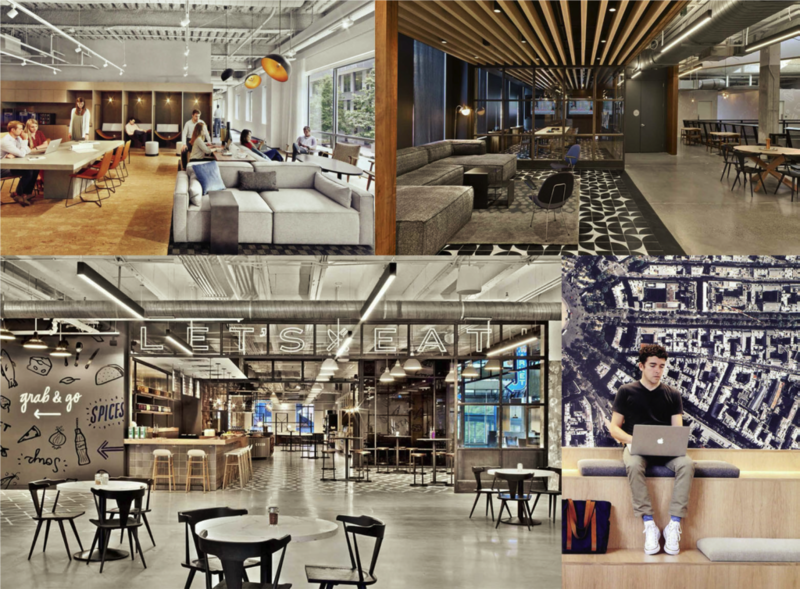 The result is a blend of environments that allow people to work in a food hall, collaborate in the courtyard, connect at a Starbucks and focus in an open office environment. Security will have a list with your name on it. Please bring photo ID. Everyone will check in via vehicular check in at the guard station. You will be instructed to park under the 1060 building and enter into the pedestrian security check in of the Building 1000 lobby. 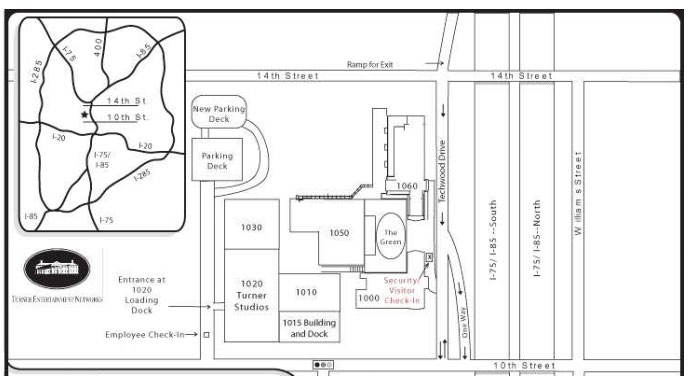 See campus map below for more information. Exit 250, 16th Street, toward 14th St/10th St. Once you cross over 14th Street, veer right toward Techwood Drive. The TBS Visitor Entrance is on the right. A Security Officer at the guard booth will direct you to visitor parking. Take parking deck elevator to 1st floor lobby of 1000 Building and check in with the receptionist. Exit 84, 17th St. toward 14th St/10th St. Vere left at fork and continue traveling toward Techwood Drive. The TBS Visitor Entrance is on the right. A Security Officer at the guard booth will direct you to visitor parking. Take parking deck elevator to 1st floor lobby of 1000 Building and check in with the receptionist. Exit 250, 10th/14th/Georgia Tech exit. Turn left at top of ramp, heading West on 10th Street. Turn right onto Techwood Drive and left into Visitor Entrance. Security Officer will direct you to visitor parking. Take parking deck elevator to 1st floor lobby of 1000 Building and check in with the receptionist.